Midwest UX 2012 Recap - Rachel Nabors, award-winning cartoonist turned digital storyteller. Wow. Midwest UX 2012 was crazy in a good way. I was eager to attend this conference from the day I heard about it. I submitted several talks, but only one was accepted, a five-minute version of my wabi-sabi talk. I wanted to do more, so I approached one of the conference organizers, the lovely Erik Dahl, about setting up a Women in UX panel. He readily agreed, and it was so. 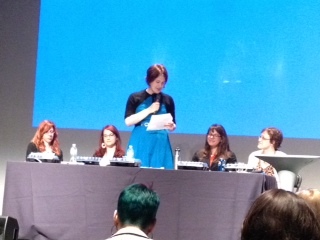 The panelists were Jessica Ivins (pronounced EYE-vans), Jen Myers, Gemma Petrie, and Alaina Kraus. I was very excited to be working with these women. On Thursday I had lunch with the panelists to review topics and get to know each other. On Friday we had the panel during a lunch session. It was a very exciting talk with the panelists and audience eagerly engaged in conversation. Much of the audience was curious to know how the panelists got started in UX, with one member of the audience wanting to know if a degree was worth the investment. (Answer: Not necessarily.) On the topic of salaries so many hands popped up in the crowd that we couldn’t get to them all before moving on to work life balance, where Jen took the lead. Turns out that balancing children with work is a complex task, one which afflicts both men and women. Interestingly, from these discussions with the audience, panelists, and one or two men at the conference, it seemed to me that women seem more likely to leave the workforce when they have children, especially if their husbands earn substantially more than they do. Sometimes it makes more financial sense for the mother to take care of the child than for her to maintain a job while paying others to care for her baby. I think of these women as the canaries in the coal mines–representatives of family life under assault from established–and often unhealthy–American work habits and outlooks. We did not have the time to go much further, but an older woman in the crowd, one Ms. Susan Shapiro, Associate Professor of Psychology at Indiana University East, took the mic and said in a voice soon choked with emotion how lucky our generation is to be able to make choices. In her day, women could be fired for getting pregnant. That was it, the end of the line. Certain jobs were for “men only.” Talking to her could only inspire one to fight to maintain (and in some states expand) the freedoms which women in this country have so rightfully earned. The audience was moved. I truly wish I had been able to spend more time with this woman. She was a wellspring of knowledge and a great personality. We only had the smaller part of an hour, and afterward, much of the audience lamented that they wish we had had two or three hours to fill. The Women in UX panel in progress. From left to right, Jen Myers, Jessica Ivins, Rachel Nabors, Alaina Kraus and Gemma Petrie. Photo kindly provided by Erin Faulkner. Girl Develop It A great organization for teaching women how to code. I wish there were a chapter here (hint hint)! High Visibility Project Post a video and share your story. There were lightning talks in the evening, of which I gave one on wabi-sabi, the Japanese concept of “imperfect beauty.” It got some great tweets, so I suppose people liked it! @rachelnabors Great presentation. I felt truly small and yet freed. Simply perfect. Responsive design was a major theme at this year’s Midwest UX. Many of the talks I went to were sure to factor it in to any discussion of process. Generally, I think everyone is still uncertain how to make the best of this new tool, but I expect the dust to settle by next year. Responsive images were not brought up once, thankfully. One of the reasons I was so excited to come to MWUX is that so many people I know on Twitter were going to be there, people I’d never met before in person. Brad Colbow, my official rival and fellow comicker/designer/developer person thing, gave a talk on “Building a Design Culture.” I was happy to hang out with him on Thursday and Friday nights at the event mixers. I was disappointed how few random people had heard of him before, but happily, most could recognize his comics! Brad’s a cool dude, and I am pleased to acknowledge him. I got to see Jessica Ivins’s excellent “Shrink It and Pink It” talk about common follies in designing for women, a talk I had heard on the SXSW podcast but wanted to see in person (which you can listen to here). Day 2 I slept in a bit because I got up at 5am the day before, not realizing that “sign in starts at 7:30” doesn’t mean “arrive at 7.” (I was probably running on fumes from having worked through the weekend to push a branding feature to Ruzuku before pitch day.) But to my chagrin, if I had come in earlier on Saturday, I would have been able to help myself to some free Rosenfeld books. It was a facepalm moment when I found out. I was soon soothed when Joe Sokohl gave me a book at the end of his session on “Mitigating Loss in the Ethersphere,” which was set to a Pretenders soundtrack and a welcome break from wireframes and flowcharts. A spontaneous trip to the art fair with Jen, Jessica and Lindsay Moore (who recognized my boots as Fluevogs on the way in) meant that I missed Brian Yeung’s lunch session about multiscreen interactions. This was a painful miss as he covered the Nintendo DS, which you must know is my pet mobile device. Giles Phillips, Director of UX at Brightcove, showed how he uses a post-it system to map the evolution of user needs in “A Lifetime of User Engagement.” I found his technique extremely applicable to my user interface design workflow and made sure to tell him so at the end of his talk. Other cool people I met and general wish I had spent more time with. Ben Callahan and Drew Clemens from Spark Box, who Brad introduced to me. This conference drove home the difference between user experience design and user interface design for me. I have definitely been doing more of the latter than the former these days. I do not engage in the kind of prototyping, wireframing and testing that UXers do, but I do employ many of their techniques–but just as often as I’m digging around inside Rails or optimizing a tooltip function to get a fade in just right. So many people complimented me on my blue dress after the panel and talk on Friday. It’s the Monique from Heartbreaker in peacock dimensions. I was poorly prepared for an unexpected cold snap, but made do for day 2, pulling together some jeans, a scarf, my sister’s hoodie, and my Fluevog “Earl of Warwick” boots. I looked a bit like a pirate, arr! 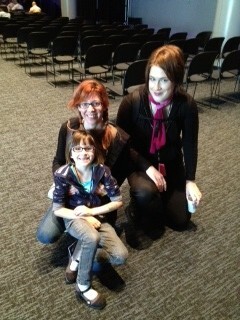 Me in pirate gear with Jen Myers and her daughter Elizabeth. Photo kindly provided by Erin Faulkner. I’m not used to seeing so many well dressed people at conferences! I wish I could have taken some pictures of them, but alas, my phone’s batteries prevented me from capturing any UX haute couture. It was a great trip, but not perfect. But they say mistakes are worth making so long as you learn enough not to make them again. This was my first time moderating a panel. Given that, it went very well. But there were a few things that could have made it go better. Have a panel backdrop. I didn't realize that there would be a projection behind us that I could use to show, say, a title card listing each of the panelists and their Twitter ids. Spend less time on intros. I wanted the audience to get a feel for who the panelists were, but we really didn't have the time to spend on such things. Give a mic to the crowd. Having an extra mic made taking questions from the audience a lot easier. There was a lot of mic passing as there were only two mics in the room. We made it work, though. Ask how you did. I didn't think about this one until after I was in the car, heading home. When someone says, "I loved your talk!" you should ask them what they liked and didn't like about it. I was just relieved to hear it was well-received, but I should have been more attentive to gathering feedback. Don't rely on cards. What feedback I did get suggested that I was at my best when I let go of my cards and spoke offhand about the slides as they were presented. I seemed "intense" and "very passionate." I have a habit of over-structuring things. I will try to practice future talks without cards. I did many things right on this road trip. Iced tea was plentiful, Sense and Sensibility was loaded into the CD player, and I even had six dollars in ones for toll fees tucked into the passenger’s seat. But two major complications did mar what would have otherwise been a pitch-perfect travel adventure. Always pack for the unexpected. I failed to notice the weather report changed drastically at the last minute. I spent much time shivering in my warm weather fashions and was grateful that I tossed in my boots and a pair of jeans at the last minute. Always double check the weather on your way out, and pack something that will aid you should the opposite forecast occur. When traveling with companions, have a plan B for last minute emergencies. Originally this was going to be an ultra girly road trip with Sarah Kahn in my smart car, and she was going to be on the Women in UX panel. But the day before departure she got very sick and was not able to travel. I had to figure out if I should wait for her or move out. It's good to make these alternate plans in advance so you spend less time dithering. Have a backup battery. My Android phone was unable to hold a charge for more than 10 hours. I had to conserve energy by not taking pictures. If you have any pictures of me, would you be so kind as to share them? Midwest UX was put together very well. The location, the Center of Science and Industry (COSI), was professional and spacious. Many attendees brought their spouses and children, who would spend the day exploring the exhibits. The catering was delicious, high quality, and well-timed. (Bonus points for providing hot water and tea bags.) The conference badges and goodie bags were carefully planned. There was always a panel I wanted to see or a lunch event or afterparty I wanted to attend. In short, the organizing committee did a fantastic job, and Midwest UX is the best conference I have been to yet. I cannot recommend it enough to UX designers and even to non-UXers: Seeing real UX at work will invigorate your process and inspire you to build better things. And isn’t that what we’re here to do? If I have gotten any names or events wrong, please do correct me. Although my notes were copious, I am faceblind and was without a camera and sleep deprived. If I’ve made a mistake, please do point it out!